I first read about this in The Consumerist and then noticed that Asylum did some investigative journalism around this untouchable monstrosity of culinary insanity. 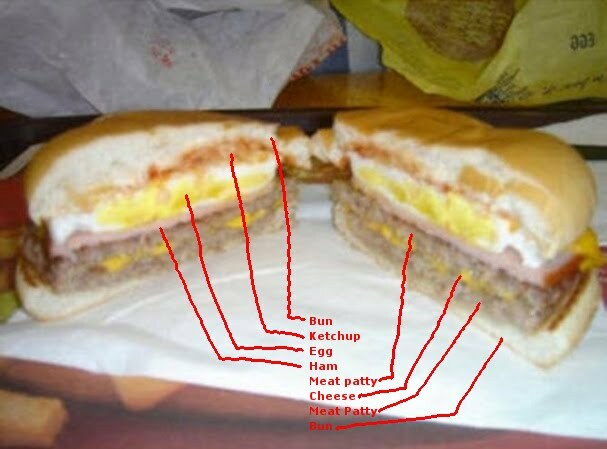 The Mc10:35 is a combination of a McDonald's Egg McMuffin and a McDouble, both ordered simultaneously at 10:35, which is supposedly a rare time when one can order from both the breakfast and lunch menus. After purchasing the raw materials, you should take the egg and Canadian bacon from the Egg McMuffin and put it on the McDouble. You have now created the Mc10:35 and undermined everything Michael Pollan stands for. Behold the terror that is the Mc10:35. It's alive!! And I'm sure it's sponsored by Heart Surgeons of America, the makers of Lipitor, and Jenny Craig. I hope you order a Diet Coke to go with it.